How to make a good first impression in your first job interview with an employer. Whether you need graduate jobs or already have years of experience, your first interview for a job is your chance to shine. You can make a great impression, or walk away without a job offer or interest in a second interview. It's largely up to you. The key with your first interview is to set yourself apart from other candidates – to make an impact so that the potential employer remembers you positively when going back through resumes and interview notes to decide who to call back. A work portfolio used to be something that was only necessary in certain professions, but this is no longer the case. Bringing a portfolio that can give the interviewer concrete examples of your accomplishments is a fantastic idea in almost all fields. Obviously, the items in your portfolio will depend on your field and your experience in that field. A recent college graduate's portfolio will include largely information from school and extra-curricular activities, but if you have more work experience, you can put even more relevant items in your portfolio. As you're preparing for a job interview, take time to put together an organized, attractive portfolio that will give your interviewers concrete evidence of your accomplishments in school or on the job. You don't want to sound like a robot during your interview, but you do want to be prepared. Don't be completely floored by typical first job interview questions about your greatest strengths and weaknesses, for instance. Instead, look at lists of questions that many potential employers ask, and give some thought as to how you'd answer those questions. It's especially helpful to think through tricky questions, like that classic one about where you see yourself in 5 years. Asking questions doesn't make you seem stupid. Rather, it makes you seem prepared and knowledgeable. Do your homework about the business you're interviewing with and the position you're interviewing for. Ask questions about how the company works, how the job will work, and how you will fit into the overall structure of the company. Don't be afraid to ask questions if you're confused during the actual interview, and don't be afraid to write down a list of potential questions to ask so you appear more organized and put-together during this portion of the interview. Can you tell me what a typical day and week in this job would look like? What are the responsibilities that go with this job? What sorts of training does the company offer, and how does career advancement work in this position? How much would I need to travel for this job? Can I answer any other questions for you that will let you know what I can bring to the table? Trainer: You're looking for a new job. Discuss a question to ask the interviewer. Me: Sure. "Why should I work for you?" Most of the time, the interviewer will probably have your resume in front of him while he's conducting the interview. It helps prompt questions, and allows the potential employer to double-check your information. However, sometimes this isn't the case, or you may be interviewed by a group of people who are sharing one copy of your resume. Take along a few extras just in case they're needed. They can also be helpful if you need to fill out a formal paper application after the interview. Making a good impression in a job interview is about balancing professionalism and personality. You don't want to be completely bland and forgettable, but you also want to stand out for the right reasons. 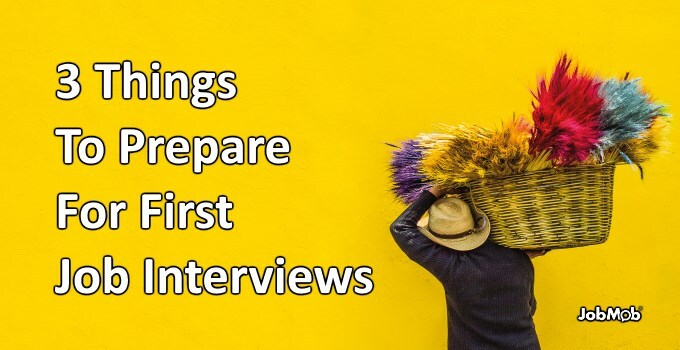 Being prepared for the questions that will be asked, putting together a professional portfolio, and asking questions during the interview are all excellent ways to make a good impression during your first interview. What was the most impressive thing you ever heard of someone doing in a job interview? Tell us in the comments. Debra Wilson is a social media advocate at CreditDonkey. She blogs about many things like how a gas rewards credit card can save job applicants (like you?) money on the next trip to the gas station. Subscribe to JobMob via RSS or email and follow me on Twitter for more great job interview inspiration. I liked the idea of having a list of questions ready. Once I was waiting in the reception area before my interview. I ask the receptionist about what they were working on. This information came in handy the interview. Your research tips are well said and right on. Another item to recall when going into an interview is to consider the person interviewing you! With a little study of personality type you might be able to tell if who you are sitting with is an introverted or extroverted type. Try to act and behave appropriately. Never a good thing to step on an introverted type’s toes. Don’t interrupt and make eye contact as much as you can, and as stated in this great blog, research the employer and study frequently asked question these items will make a big difference in landing that job. Having a portfolio at an interview will do wonders. It is often overlooked, and having a good portfolio will really set you apart. You may want to change the contents depending on the job, for example: If you are applying for a job that requires you to operate a vehicle, include your driving record. Applying for a job that puts you in a position to handle large amounts of money, include your credit report.